If you are going to Oia this evening to admire the sunset, you are going to get a pleasant surprise. On a terrace, using the sunset as the background, in the area of Kastro, a couple of dancers accompanied with a guitar will offer you unique moments. 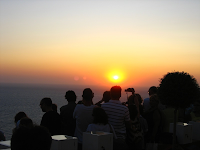 The idea and the organization of the happening belong to Thira’s municipality. So, dance in modern rhythms enjoying the sunset. At 20:15.